As an IB World School, Mercedes-Benz International School (MBIS) offers its students the opportunity to undertake the International Baccalaureate (IB) Diploma Programme (DP). This programme, one of the three offered by IBO, is a rigorous two year pre-university education programme, leading to examinations, for highly motivated students aged 16 to 19 years old. It is a very demanding undertaking and students must be prepared to put in sufficient effort and individual enterprise. 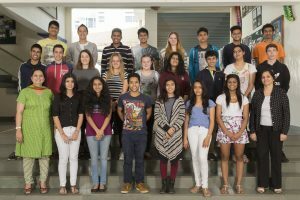 While it is very academically challenging and rewarding, it is still possible for weaker students to attain the IB Diploma – provided they are determined to do so. The DP is much more, however, than a series of academic subjects. Its unique additional features of Creativity, Activity, Service (CAS), Extended Essay (EE) and Theory of Knowledge (TOK) ensure that students are made aware of their community responsibilities, are encouraged to develop their research skills and become independent thinkers. The underlying philosophy is that students should share an academic experience that would emphasise critical thinking, intercultural understanding and exposure to a variety of points of view. The DP follows a pattern, which is consistent throughout IB schools worldwide and which allows internationally mobile students to transfer from one IB school to another. In the USA, achievement on an IB course, Diploma or Certificate, is seen as a sound basis for awarding credits at most of the major universities.